I know there's a couple for sale at dealers but they are top money and miles away, anyone thinking of selling ? I'm in mourning because I can't afford one and I would need my legs lengthened. Here's one, just to upset you like. I wonder if they have got one or have not updated there website. 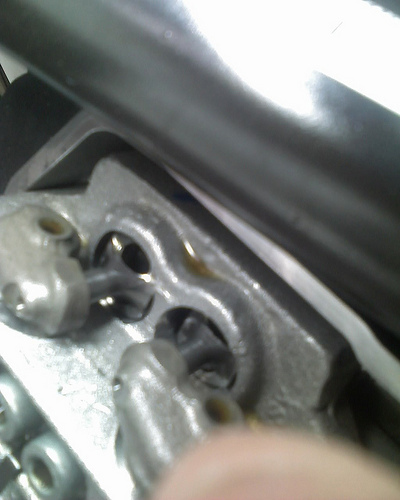 Just spoken to a dealer who has a 14 reg Sport Corsa for sale and he told me that they had fitted new cylinder heads as a factory recall, I assume this means that this bike had flat tappets and now it has roller tappets, I believed that buying a 2014 bike it would have rollers when built, can anyone shed any light on this as I am now confused, I thought all the Corsas would have the new valve gear. Is this the dealer in Worcester? I discussed this whole area with Piaggio in the UK - and IF the bike has been serviced correctly (i.e dealer stamps all present and correct), which I assume this one has, should there ever be a problem with the dreaded cam followers Piaggio will supply for dealer fit, a free kit (sounds like what you already have got) - all you have to pay for is the dealer to fit it - circa £300. I also would have thought it would be better for the bike to have this fitted when new(ish) as everything else will be new and pristine - so the tolerances and the like will ALL be as new. The iffy area I guess, is buying one that hasn't got all the dealer stamps - then it needs the kit - I guess Piaggio wouldn't supply it for free then. How can we find out when it was built and when it was registered. The info is on the vin plate .... Guzzi dealers check against the system Any vehicle can have a manufacturers recall. Not a problem if they are actually done....As I found out tho an 03 bike with a mere 12k miles and over 13 services ALL at Guzzi main dealers and NONE of the recalls done! As far as I know all sports are flat tappets, get the dealer to lift a rocker cover and it is easy to see if flats or rollers. This is what rollers look like and flats are totally different. Well if it's had the heads replaced, it should now have roller tappets. A 2014 reg bike could easily have been built early 2012. The date of manufacture can be seen stamped on the frame just behind the headstock (you have to pull the tank back to see it. It is also shown in the VIN. How many miles has the bike done? The less the better as if the flat tappets have gone, just think of all that swarf floating around in the oil.